Death on the Nile is a hidden object murder mystery detective game. The renowned Belgian private detective Hercule Poirot is on board the S.S Karnak, taking a holiday down the Nile. But one of his fellow passengers, a wealthy heiress is murdered. And it seems she has a good many enemies also on board the steamer boat, which means there are plenty of suspects and motives for Poirot to investigate! As Poirot, you have 12 investigation games to complete successfully, including searching each room for clues, interviewing the passengers and sifting through the evidence to discover whodunit! As you set sail in Agatha Christie's Death on the Nile game, in an atmospheric and thrilling whodunit, you assume the role of supersleuth Hercule Poirot, it's up to you to solve the shocking murder mystery of killed Linnet Doyle. As you start your interrogation, you begin to uncover that each passenger has a possible motive and realize that everyone is a suspect. Was it the betrayed maid, the disgraced writer, the jealous ex fiancé - or someone else? Using the original storyline to full effect, this hidden object game brings the beautiful setting of 1930s Eygpt to life, with stunning scenes, surprising twists and turns and hours of sleuthing to enjoy. You have 24 rooms to explore with 12 investigation games plus plenty of mini puzzles and mini-games to solve along the way, such as matching Poirot's observations to the corresponding suspect. It's up to you to piece together the clues and solve the murder mystery AND before the killer strikes again. 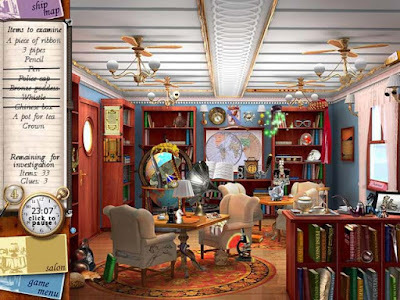 The exciting atmospheric Agatha Christie story combined with an excellent hidden object mystery game. You take on the role of the famous sleuth Hercule Poirot. Uncover a thrilling murder plot as you sail down the Nile. 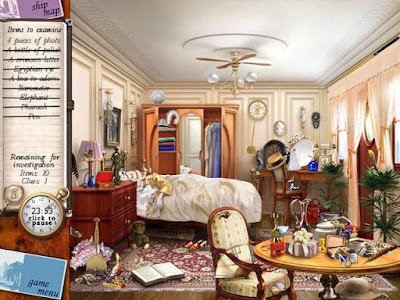 Find hidden objects in keeping with the 1930s theme in amazingly detailed rooms. Play multiple mini-games to reveal the intriguing secrets of the other passengers. A hidden object game that will satisfy both murder detective fans and fans of puzzle games. US Amazon: Agatha Christie: Death on the Nile [Download]. UK/EU Amazon: Agatha Christie Hidden-Object Double Pack - Death on the Nile Plus Peril at End House (PC CD). 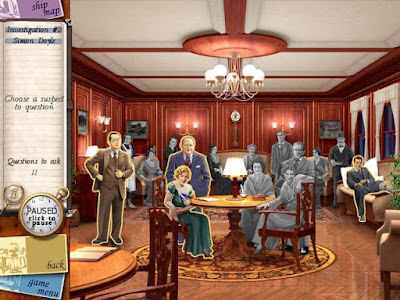 For all the Agatha Christie games for PC. 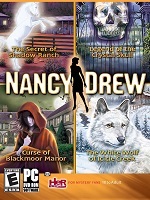 See my post: Agatha Christie Games List for PC.